WARMTH WINS WITH HOODED COMFORT. 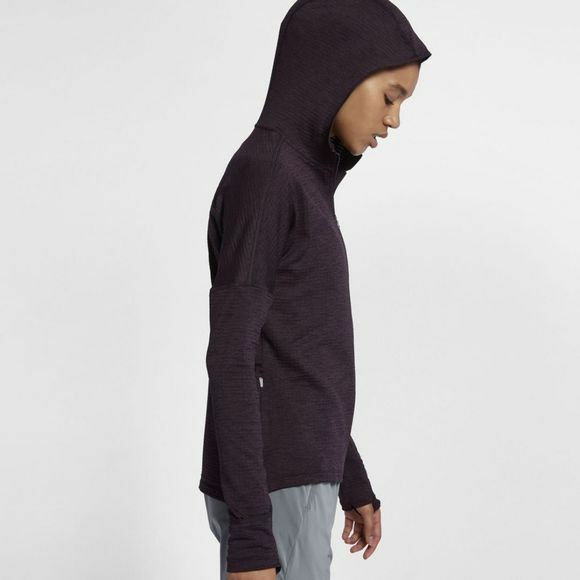 Brave the cold in the soft comfort of Women's Nike Therma Sphere Element Running Hoodie. Its sweat-wicking fabric and brushed interior surface will help keep you dry while convertible mittens and a running-specific hood seal in warmth. Zippered pocket on the right hip secures small items. Mittens at the sleeve cuffs seal in warmth. Reflective dots are heat transferred on the center back. Dropped shoulder design allows nonrestrictive movement. Split bottom hem enhances range of motion. Front hem hits at the hip and the back hem is dropped slightly for coverage.